The Sydney Koru Lounge may just be my favourite Air New Zealand lounge visited to date. I arrived ridiculously early (which didn’t set off an alarm as happens in the domestic lounges when you arrive more than four hours in advance of your flight) after making the decision to head to the airport hours ahead of my flight rather than dragging a suitcase around the city. Once you’ve cleared customs and Duty Free the Koru Lounge is on the 2nd floor mezzanine over Gate 56 and is open every day from 2.5 hours before the first flight until the departure of the final flight for the day. 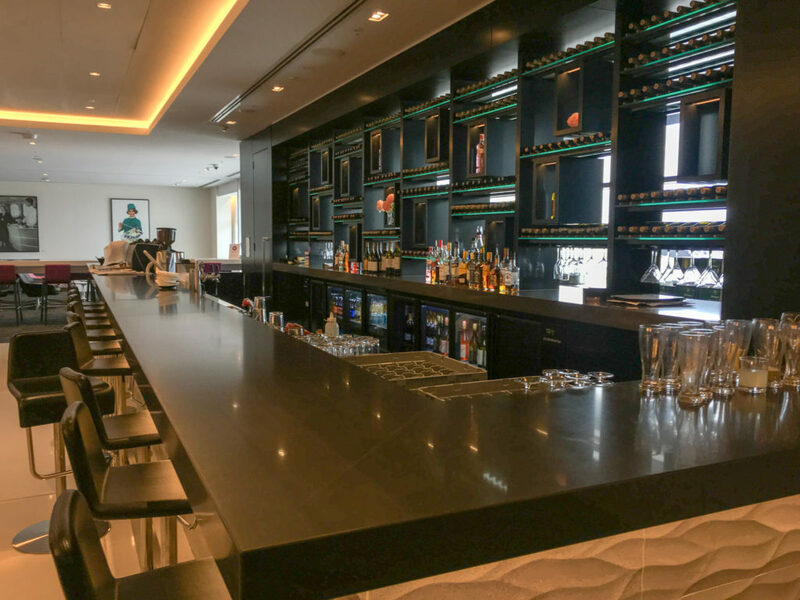 This Sydney airport lounge is open to Airpoints™ Elite, Gold, Elite Partner and Koru members as well as Business Class passengers departing on Air New Zealand flights. It’s spacious to the extreme – 1450 square meters with seating for 299 guests and is long in shape which means lots of windows and natural lighting as well as being white and bright by design. As is typical of Air New Zealand Koru Lounges there are a range of different areas to sit in depending on your needs. There are areas fitting for dining, enjoying a drink from the bar with a group, long tables with plenty of power outlets for working on a laptops or charging electronics and armchairs with low tables you could happily sit at all day. Swivel chairs sit positioned for the best views of the runway and out towards the city of Sydney and a strong partition separates the business zone from the bar and more casual lounge area and the retro kiwiana artwork on the walls will make you forget that you’re not in New Zealand. For me the ‘Food Theatre’ where a chef stands at a food station and prepares a dish in front of you was particularly novel and makes it stick out in my mind from other Air New Zealand lounges I’ve visited. On the day I visited it was mussels in a tomato broth. The buffet selection was pretty standard and didn’t really change while I was there – a few hot dishes, cheese and crackers, sushi, salads, a couple of deserts. My go-to Koru Lounge wine at the moment is the Villa Maria 2018 Rose Pinot Noir. It’s only around $15 in the supermarket and reminds me of flying when I drink it at home. There is of course a full, staffed bar should your drink of choice require a little more finesse than New Zealand wines, international beers, and basic spirits and mixers. Barista made coffee can also be collected here – ordered through your app or an iPad on the counter. The bathrooms alone in comparison to the public terminal toilets make an airport lounge visit worthwhile. These have huge pink doors, and beautifully scented Antipodes hand soap and hand cream. I didn’t pay much attention to the showers, children’s play area or business facilities but they were there and did not look highly used. The hours wizzed by, peaks came and went, and my flight was called in what felt like no time at all. I appreciate the time I get to spend in airport lounges so much – they’re a great way celebrate the start of a trip or to come down from a travel high and ease yourself onto a plane home. This looks amazing! I’ve never been to a lounge like that, I bet time flies there!